POET-DSM Advanced Biofuels becomes one of the first in the world to start production of cellulosic ethanol. The Statue of Liberty is well known as a universal symbol of freedom. It’s not surprising, then, that those same values are reflected in the name POET chose for its new commercial-scale cellulosic ethanol plant. Project LIBERTY in Emmetsburg, Iowa is likened to a symbol of freedom from the country’s reliance on foreign oil. Project LIBERTY represents the first undertaking of a POET-DSM Advanced Biofuels Joint Venture and comes after years of research, bench-scale demos and pilot operations into the production of cellulosic ethanol. With the commercial-scale facility underway, make no mistake about it: producing cellulosic ethanol is a whole new game. Cellulosic ethanol is ethanol made from cellulose and hemicellulose, a non-grain material/feedstock that provides the cellular structure for all plants. The end product – a clean-burning, high-octane fuel – is the same as ethanol made from corn. This plant material, referred to as biomass, is pre-treated to allow enzymes to act on the cellulose and hemicellulose. That tough structure that allows plants to stand erect is also what makes cellulosic ethanol production a challenge. It is much easier to digest starch into sugar with enzymes than to digest cellulose and hemicellulose into sugar, so pre-treatment is necessary. To determine the best approach for producing cellulosic ethanol, POET started in the lab, then built a pilot scale facility which laid the groundwork for Project LIBERTY and allowed a ramp up to commercial scale. Project LIBERTY traces its roots back more than a decade, to 2001, when POET began studying cellulosic ethanol production. Lab-scale cellulosic research on various feedstocks and processes followed. By 2007, POET had announced its plans to use corncobs as cellulosic feedstock and began testing biomass collection methods on 4,000 acres in South Dakota. A year later, POET was ready for a pilot-scale cellulosic facility to become operable, while continuing its biomass collection testing. The whole purpose of the pilot facility, according to Dave Bushong, Vice President and General Manager at POET Research Center was to develop technology and reduce risk for Project LIBERTY. POET was replicating, on a small scale, what the commercial-scale facility in Emmetsburg, Iowa would later become. When POET applied for grants through the U.S. Department of Energy, one of the main criteria was that a plant would be able to process 700 metric tons of biomass. Bushong says the necessary input of 700 metric tons of biomass per day has posed a challenge. “But it’s something we’ve had in mind as we moved from bench top to pilot to commercial,” says Bushong. Jeff Heikes, Vice President of Project Management and Engineering for POET Design and Construction, remembers those early days very well. A POET veteran of 12 years, Heikes started preliminary work for Project LIBERTY back in 2006. “We knew we had to process a minimum equivalent to about 770 short tons on a daily basis. We basically scaled all the processes forward from that knowledge, the fermentation, the digester and so on. All unit operations were set from there. That was the basis of our entire design,” says Heikes. Research and development at the front-end (biomass) is only part of the picture. Bushong explains that the pilot project has also provided opportunity to further develop solutions for the back end of cellulosic ethanol production. “You have these solids left over. So what to do with them is a challenge as well,” he adds. When biomass is brought into the facility and converted to cellulosic ethanol, there are polysaccharides from unconverted cellulose and hemicellulose, as well as remaining lignin that is left over. Another part of the picture is the significant advances in both yeasts and enzymes that needed to be made to achieve commercial production levels. The pilot project afforded POET the opportunity to take what was learned about the most effective strains of yeast during earlier research and development stages, and apply it on a small commercial scale before moving on to the Project LIBERTY facility. A similar scenario unfolded for enzymes, as the pilot project enabled bench-scale enzyme technology to be moved to pilot-level production, prior to the launch of the full-scale plant. Enzymes are critical to cellulosic ethanol production and act as key catalysts in the process. Further enzyme development may also lead to onsite manufacture of enzymes, which could improve efficiencies and reduce operational costs. The challenge of moving to commercial scale has been massive. 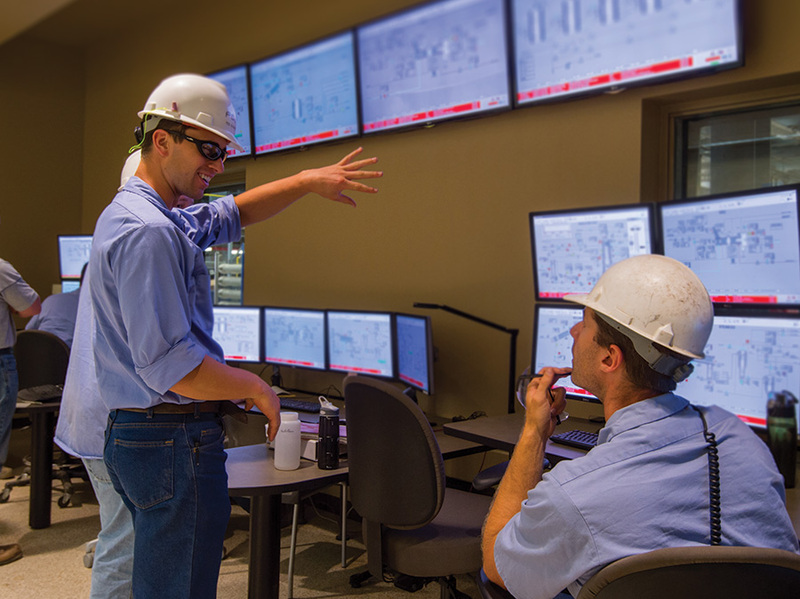 “We don’t have a lot of back-up data to support us other than what we’ve done in our pilot plant. There is a lot of risk mitigation that goes into Project LIBERTY. But this is what POET does. It’s what we’re good at,” Heikes says. Final preparations for the commercial-scale plant to become operable in Emmetsburg began back in January as the plant moved through the checkout process for becoming fully commissioned. Because the plant is co-located with an existing ethanol plant, agreements are in place to share resources and opportunities, allowing both sites to run more efficiently. Construction of the plant itself was a tremendous undertaking from a manpower standpoint. “There was a point in time where there were well over 300 people just working on construction. It was like an orchestra for our project manager to put people in the right place at the right time, compared to a typical ethanol plant’s construction where there are maybe 100 to 150 at peak,” Heikes recalls. As Project LIBERTY moves to commercial production, it ranked at or near the top as one of the industry’s largest-scale cellulosic ethanol plants – not only in North America, but worldwide. The plant will be producing at a rate of 20 million gallons of cellulosic ethanol per year as it gets off the ground. Once it reaches full capacity, it will churn out 25 million gallons on an annual basis. Probably the biggest difference between producing starch-based ethanol and embarking on a commercial-scale cellulosic ethanol operation is that cellulosic plants have not previously existed anywhere in the world. That’s what makes it revolutionary. The team at LIBERTY has been putting in long hours working through the kinks of starting up a first-in-the world process. Moving from the lab to pilot scale to commercial scale has definitely had its challenges, but as LIBERTY will start to churn out cellulosic ethanol, it will all be worth it. Sacrifices were made by many who have touched this project, but they’ve all had a hand in creating a process that will change the way the world views liquid transportation fuel and reduce the U.S. dependence on foreign oil. That’s a pretty cool story to tell the grandkids.